We've built a number of hardware systems we use in our research. Bluehive is a multi-FPGA compute cluster targeted at scientific simulations with demanding communication requirements. Bluehive is designed to be extensible with a reconfigurable communication topology suited to algorithms with demanding high-bandwidth and low-latency communication, something which is unattainable with commodity GPGPUs and CPUs. Conceived to easily scale to 64 FPGAs, we've built one box of 16 FPGAs so far. Each FPGA is an Altera Stratix IV 230GX, on a Terasic DE4 evaluation board with up to 8GB DDR2 RAM. We use the many high-speed transceivers on the FPGAs to provide massive bandwidth at low latency - each board has 12x 6Gbps bidirectional links giving a total box bandwidth of 1.5Tbps while holding 128GB RAM. To achieve this economically we designed and open-sourced a PCIe-SATA breakout board which we use to provide repluggable connections to experiment with different network topologies. Bluehive is used for the BIMPA project to do massively-parallel neural network computation, and also for distributed processor design over multiple FPGAs. Bluehive paper: Simon W. Moore, Paul J. Fox, Steven J.T. Marsh, A. Theo Markettos, Alan Mujumdar, Bluehive - A Field-Programmable Custom Computing Machine for Extreme-Scale Real-Time Neural Network Simulation, 20th International Symposium of Field-Programmable Custom Computing Machines (FCCM), pages 133-140, April 2012 (PDF preprint) (DOI: 10.1109/FCCM.2012.32). 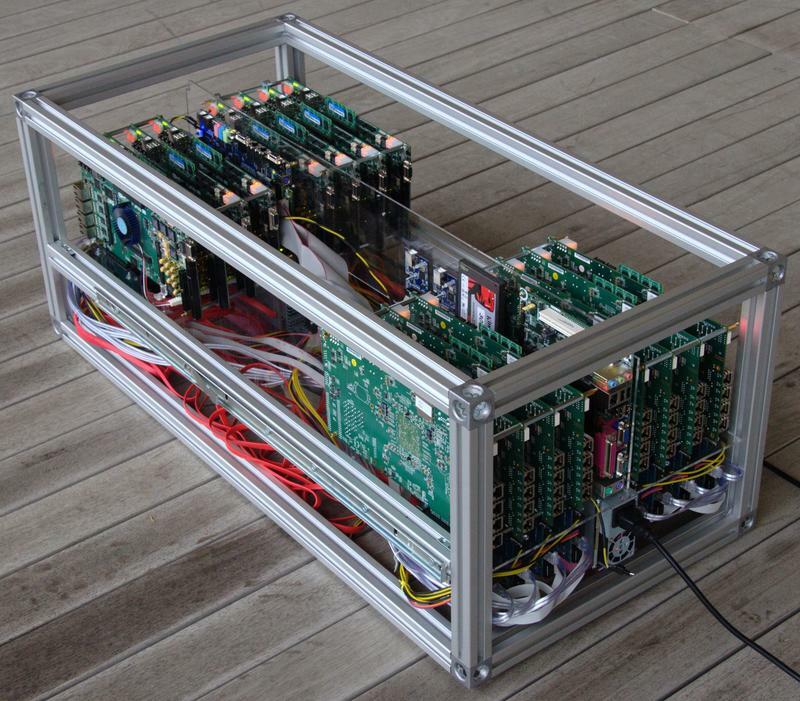 CHERIcloud is a custom server comprising 7 FPGA-based nodes, designed for the CTSRD and MRC2 projects. 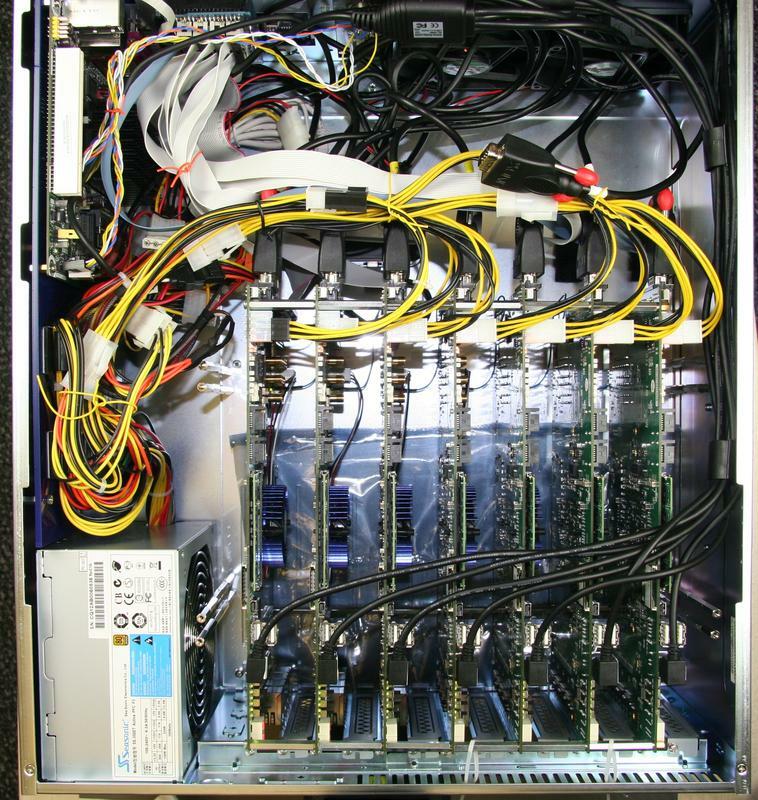 Each node is a Terasic DE4 board that runs the CHERI 64-bit MIPS processor and the full FreeBSD UNIX operating system, each board connecting to the internet via gigabit ethernet. CHERIcloud is used as a cloud server to give external developers access to the CheriBSD environment. The DE4 Tablet is a portable FPGA computer, capable of implementing one slice of Bluehive or CHERIcloud in a mobile format. It has a battery, touchscreen and HDMI output sufficient to give presentations and demos directly from the FPGA. We've open-sourced the design so you can view the instructions and build one yourself.